Not too long ago I was at a bar in my neighborhood, a place not in my usual rotation but with an expansive tap list and many televisions, making it an ideal place to catch a game or three. Or to kill an hour while waiting for a friend to pop out of the train station. I sat at the empty bar and ordered a lager. When the shaker pint arrived, I had a tough time seeing into the straw gold liquid because of the thick layer of carbonation lining the inside of the glass. While I struggled to comprehend the staggering level of filth that had accumulated in the glass, the bartender turned back to a trainee finishing up a conversation about his “serious beer geek cred” with his peers and a recent beer trade he just made. I caught his eye and told him that I needed to send the beer back. “Sorry you don’t like the taste,” he told me. “It’s a craft lager so it might not be for everyone, but I’m still going to have to charge you.” Now, with my Irish temper just bubbling below the surface, I informed him that it wasn’t the taste, it was his serving an otherwise excellent beer in a dirty glass. He sheepishly took back the glass, tried to offer me a clean one, but my stomach had turned and I simply left. Even as I write this, I know that was an extreme reaction. But life is too short and beer is too good to be served in a nasty glass. Yet I see it all the time—although, thankfully, it’s not as severe as that place. Carbonation is the spark of beer and a necessary part of the drinking experience. As those little bubbles of CO2 rise from the beer to the surface, it’s doing an important service in not only appearance, but also aroma and mouthfeel. Some glasses have tiny etching at the bottom—nucleation sites—to concentrate the carbonation and add some uniformity to the rising. It’s essentially an imperfection in a smooth surface. So that’s what we’re seeing when carbonation is clinging to the side, but rather than a divot carved into the class, this is gunk stuck to the glass. It can be anything from soap, lipstick or leftover food from the dishwasher. No matter what it is, it’s not something we want to be drinking, and as more and more bars up their beer game, they need to be paying attention to how the beer is served. We, as educated and passionate beer drinkers, need to speak up as well. If you see a dirty glass (like the one pictured above), you don’t need to make a scene, but you should take the opportunity to explain why it turns you off. Hopefully, the bar will re-evaluate its process. 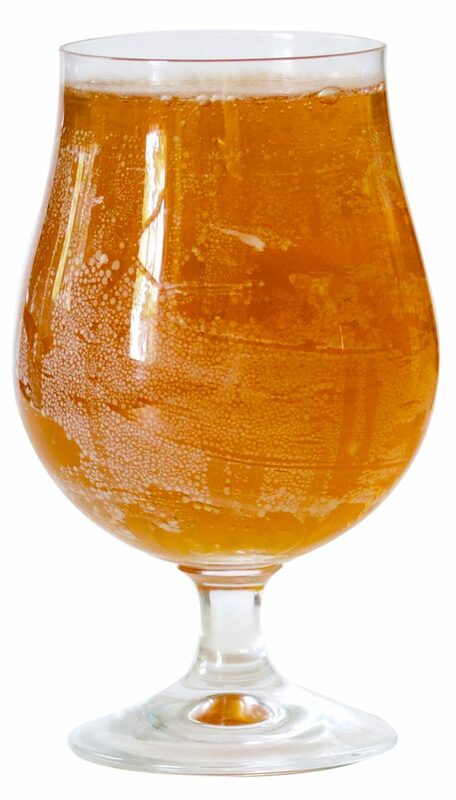 At home and in the office, I use Beer Clean bar glass cleaner, a powder, and a little bit goes a long way. If you’ve ever sat at a bar near the sink when glasses are being (properly) washed, you’ve likely seen it in action, and it’s available in the cleaning aisle at most stores. As this issue was going to bed, I was watching a documentary that focused on two small breweries and various challenges they were facing. Video chronicling the opening night of one brewery had a shot of a filled logoed pint glass with—you guessed it—carbonation stuck to the side. We’ve come a long way with getting liquid choice on tap, but still have a long way to go in other ways. Why don’t you offer any solutions? I think your “Irish temper” energy would be more helpful and productive if you used it to write an SOP on the equipment and methods for properly washing glasses rather than sitting there whining about it. Thanks for reading. Actually, I did offer a solution. If you look at the second to last paragraph, mentioned what I use here at the office and at home to keep glasses sparkling. I also offered the solution of speaking up. Now that you know what a dirty glass looks like and why, you should have no trouble letting the offending bars/restaurants know about it and urge them to step up their game. So if the carbonation is mostly sticking to the side of the glass rather than rising to the top, it’s fairly safe to assume the glass is dirty?